Mr. Nikitin, we met four months ago, only a short while ago. For this reason, the situation in the region is quite clear. Nevertheless, I would like to inquire about specific issues that we discussed. What has been done, and what, in your opinion, has yet to be undertaken? I will also hand over to you this folder from the Direct Line. While there is nothing unusual there, questions that are a matter of concern for people require special attention. I would like to reiterate what I have already told many of your colleagues: it is clear that some things cannot be fixed in a single day. In some cases problems have been piling up for many years. That said, it is important to pay attention to these issues so that the situation gradually changes for the better. Mr. President, the first and foremost issue I would like to start with is the road network. We agreed that there will be additional funds allocated. How much have you received? We have not received them yet, but we have already started work with our own reserves while we are still waiting for them. Did you agree on the amount you will receive? The road that businesses asked for is marked in green [in the presentation]. This is Borovichi, our largest city after Novgorod. The blue is the federal roads, the red is what is also in an emergency state, something that we will have to work on as a priority, in the nearest future. This is a fundamental network. It connects districts, schools and hospitals. These are key facilities that are of primary importance for the people. 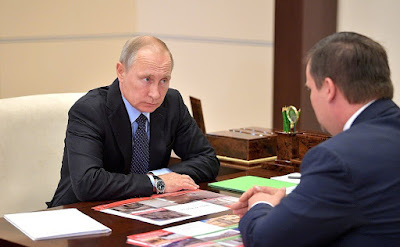 Vladimir Putin at the meeting with Governor of Novgorod Andrei Nikitin. The second major sector is healthcare. There was a very pressing issue connected with the shortage of medicines due to the deficit of money in the budget. Thanks to your support, we have resolved this issue, so that people in small villages with a population of less than 100 people will be able to have medical examinations in time. Unfortunately, the Novgorod Region is in 84th place today nationwide in terms of mortality rate. Despite the fact that the area has the necessary infrastructure, people do not get to see doctors as soon as they need to, so that by the time they are diagnosed the illness is at a late stage. This is why we are going to be among the first to boost the development of mobile paramedic units, the maximum number of clinical examinations, preventive measures and, of course, telemedicine, digital medicine, which you spoke of today and which we are working on as part of the digital economy program. As for medicine, I also said that you will be provided with additional aid for specific medical institutions. I signed an executive order on the allocation of additional funds. They are to be allocated for the regional children’s clinical hospital in Novgorod, Novgorod clinical specialized psychiatry center, Borovichi central district hospital and Khvoinaya central district hospital. This is the first tranche. We agreed that such aid will be rendered to the healthcare institutions whose need was especially urgent. I hope that you will administer the funds in such a way that people will see real change. This is how it looked at the start [photo], the issue we talked about today, and of course, we have already started the preparations for all these works. So all the projects are ready, all the necessary steps have been taken. The goal is to do everything this year. This situation needs to change. Doctors cannot work in such hospitals anymore, and patients cannot receive treatment there. Vladimir Putin with Acting Governor of Novgorod Region Andrei Nikitin. Another important issue is dilapidated housing. We have finished the program of relocating residents from dilapidated housing in the part where it was done as of 2012. Three houses have been commissioned: in Staraya Russa, Valdai and Chudovo. Unfortunately, it has been determined that the quality of work is inferior in a number of houses that were commissioned earlier, and we are now allocating additional funds from the regional budget to eliminate the leaks. I see, to bring the standard up to the level required by state regulations. Another important problem that we are tackling as a priority is water supply. Regarding work quality, you need to impose penalties on construction companies. Mr. President, I submitted all the documents on these buildings to the prosecutor’s office and asked them to conduct a full-scale investigation to find out how the decisions were made, how the contractors were selected, and why some of the contractors disappeared six months after construction was completed. We are doing comprehensive work in this area. Another significant issue, perhaps the most important one for the Novgorod Region is the area where the biggest battles took place. You have met with our scouts. Here is what I would like to highlight. Of course, our small business owners and ordinary people in districts are helping a great del. Thanks to their efforts and with limited municipal funds we are gradually bringing military burial sites to order, to a good state. But today just under a million people are still under ground in the Novgorod Region, people who have not been found and have not been buried. What I would like to ask for is that a comprehensive program to create large military memorials in such regions as ours is launched in the run up to the 75th anniversary of the Victory. To make sure that these burial sites are worthy. We are ready to participate in this. Because, as they say, the war is not over until the last soldier is buried. This is my request. All right, this needs to be done. We will work together with you. I would like to wish you success. There is a lot of challenges. 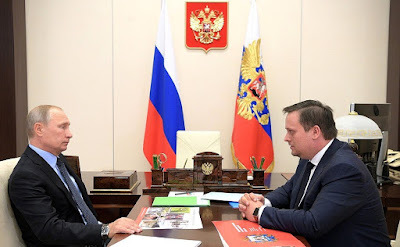 I hope that, like I said, you will use all your experience to tackle them efficiently and in the interest of the people living in the Novgorod Region. 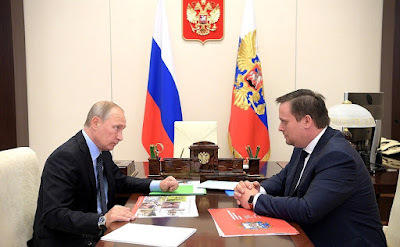 0 Comment to "Putin met with Acting Governor of Novgorod Region Andrei Nikitin"